Steampunk Tower Defense Game has unique mechanics! Build and upgrade your cannons on the one big growing tower! Rebuild your tower on the way by moving cannons! Test your ultimate tactical skills in challenge levels! You only have one tower to work with, and enemies come from both sides. But your weapons are many, your upgrades are beastly, and your tower always has room for another turret! Stand up and defend your steampunk tower! Build and upgrade the ultimate attack tower to defend yourself from wave after wave of enemy onslaught. 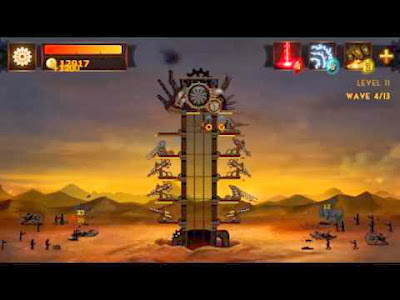 Steampunk Tower is a defense game that puts you in charge of defending a tower. You will need to build, upgrade, and drag cannons within your tower to kill waves of enemies that approach from both sides of the screen. Build cannons in your tower's cellar, and then move them onto platforms so that they fire at the approaching enemies. In order to upgrade or sell a cannon, you will have to move it back to the cellar. Once you have built as many cannons as there are platforms, your tower will automatically grow another story. Try to earn the maximum number of stars in each level, and spend them on cannon upgrades. Ӏ liκe іt when indiviԁuals gеt together and ѕhare ideas.